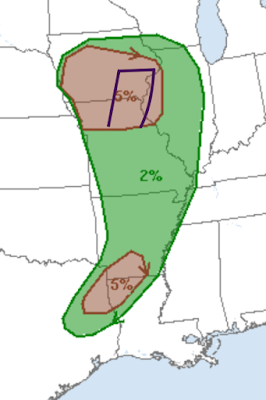 The NWS SPC has updated its tornado potential maps with the significant risk in brown. I've added a rectangle in purple where I believe the highest threat to be during the hours of 4 to 7pm. Please keep an eye on the weather in any of these areas. The tornado/severe thunderstorm threat to the KC metro area has ended.